A 23-3 run over the last eight minutes of the ball game propelled the Florida Atlantic University men’s basketball team to a 76-62 win over Marshall on Saturday. The Thundering Herd (4-14, 0-5 C-USA) started the game on a 13-4 run and led by as many as 11 points. The Owls (8-8, 1-4) made a small run, capped by Marquan Botley converting a three point play just before the half, to cut the lead to 34-30. The two teams exchanged buckets early in the second half, before Marshall built a small lead with Aleksa Nikolic’s jumper putting the Thundering Herd ahead 59-53 with 8:18 left. At that point, the Owls’ defense kicked into gear, surrendering just one field goal and a free throw for the remainder of the contest. 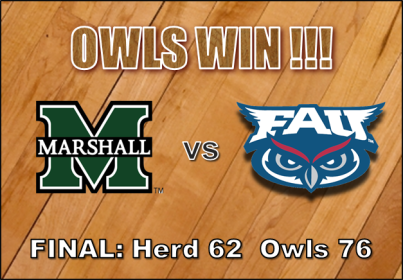 Four different Owls scored during that time, and FAU went 8-for-8 from the free throw line to ice the win. “Tonight, we got stops and didn’t turn the ball over, which is one of our points of emphasis,” said FAU head coach Michael Curry. Botley scored 17 of his team-high 23 points in the second half, while the frontcourt tandem of C. J. Turman and Kelvin Penn combined for 25 points and 16 rebounds. Solomon Poole added 18 points. The win is the first in conference play for FAU and snapped a four game losing streak. The Owls now have some time off, as they don’t play again until they travel to Charlotte on Thursday, Jan. 29. Tip-off is set for 7 p.m.